Only a couple decades ago, producing a simple video clip was a complicated process that required expensive equipment as well as a considerable amount of skill and knowledge about the art and craft of video making. Today, people who want to create a tutorial or a gaming video can produce high-quality video recordings of their desktop screens. If you are looking for a fast and inexpensive way to capture your desktop activities, you've come to the right place, because in this article we will show you how to record your desktop screen with free built-in software on Windows or with some free screen recording software. Before we proceed any further, we must first highlight the distinction between a screenshot and a screen recording. A single static image or a screenshot is just a picture of a computer screen at any given moment, while a screen recording or a screencast, as it is sometimes called, is a video that captures your desktop activities over a prolonged period of time. Even though, it is not common knowledge Windows OS offers built-in tools that enable its users to record their screens for free, these tools have their limitations. Furthermore, there are many free computer programs and online tools that make the process of screen capturing simple and fun. Let’s figure out how to achieve it now. Recording a desktop screen is not an overly complicated process, but PC users that have no previous experience may need some time to figure out how to make high-quality recordings of their screens. Before Windows 10 was released, recording a screen required you to have a screen recording software, but now the recent versions of Windows 10 come equipped with the Xbox app that lets you capture your desktop screen. If you are having trouble finding this app, simply type Xbox into the search bar and click on its icon to launch it. Hold the Windows + G buttons until a pop-up screen appears, and then select 'Yes, this is a game' option when it popped up "Do you want to open Game Bar" if you are using it for the first time. You will see the Game Bar interface with several controls including Xbox app, screenshot, screen recording and settings options. If you want to record your microphone and your own voice, just checkbox “Record mic”. To record your desktop screen activity, you can either hold the Windows, ALT and R buttons on your keyboard to start the recording session, or you can simply click on the 'Start Recording' icon. The same shortcut can be used to stop recording. All videos will be saved in the same destination folder named Video/Capture, and the app won't let you change this setting. 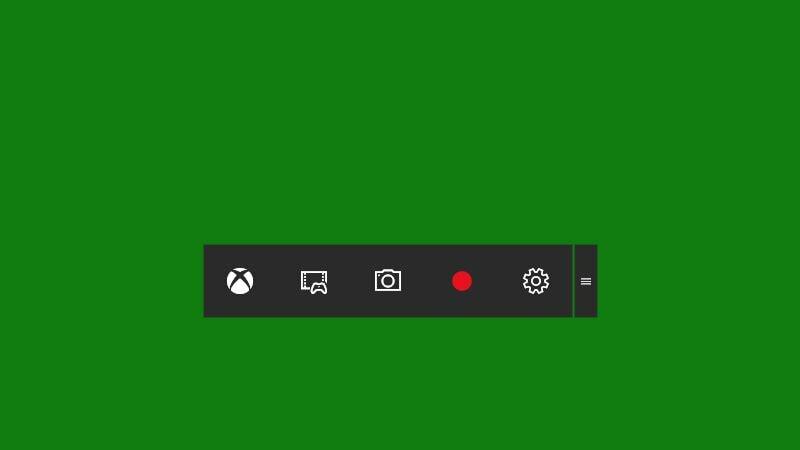 However, the DVR feature in Xbox app will allow you to choose the duration of your video or increase the quality of the video you're recording but the mouse cursor will not be recorded. Some computers that support Windows 10 will not let you use this app if your video card doesn't support AMD VCE, Intel Quick Sync H.260 or Nvidia NVENC encoders. Microsoft's PowerPoint software is a well-known tool for the production of professional presentations, but the latest version of this computer program (PowerPoint 2013 or Office 2016) also provides the screen recording option. In order to start the recording session, you simply have to launch PowerPoint and head over to the 'Insert' tab. Locate the Screen Recording button and once you click on it, proceed to click on the 'Select Area' option that will enable you to designate the area of the screen you want to record. If you would like to capture an entire screen, hold the Windows, SHIFT and F keys simultaneously. After you've made the selection simply hit the Record button to initiate the screen recording session. The screen recording options MS PowerPoint provides are somewhat limited, which is the reason why this feature should only be used if you have to produce a screen recording in a short period of time. The built-in software on Windows 10 may be a great way to produce a quick screen recording, but if you want to create professional software walkthroughs, let's play videos or tutorials then using a free screen recording software such as FlashBack Express is a much better option. You can hardly go wrong if you decide to use this screen recorder that enables you to precisely designate the area of the screen you want to capture. This software produced by the Blueberry Software company lets you record literally anything on your screen and it also enables you to record video from your webcam. 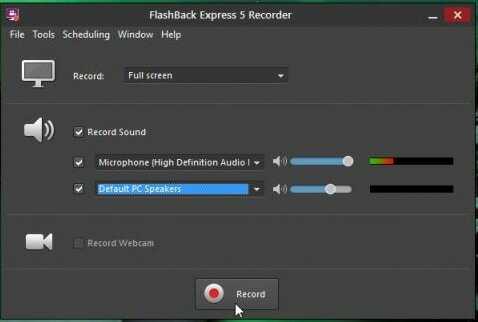 If you opt to install this screen recording software on your PC, you'll be able to record computer audio, schedule the recording session and in addition, you'll never have to worry about annoying watermarks because FlashBack Express produces watermark-free videos. The process of setting up the screen recording session is remarkably easy since all you have to do is hit the record button and the software will allow you to record videos of any duration. Despite the many advantages, this screen recording software offers, the FlashBack Pro version of the computer program is better suited for users who want more control over the screen recording settings. We all live fast-paced lives, and sometimes we simply don't have the time to go through the trouble of installing a software on a computer. Luckily there are countless free online screen recording tools like Screencast-O-Matic that can be used to create a desktop screen recording quickly. Screencast-O-Matic is a free online tool that provides a number of great screen recording options that let you select the area of the screen you want to capture, pick the size of the output video, record narration or choose whether you want to record the screen, webcam or both at the same time. Setting up a recording session is simple since it only requires you to click on the record button after you've adjusted the settings. However, in order to start using this powerful online screen recording tool, you must first download and install the web launch recorder. Furthermore, the option that lets you record Computer Audio is only available on the Pro version of this online tool, while the maximum length of a video recorded with the free version of Screencast-O-Matic cannot exceed 15 minutes. The maximum quality of a video file this online tool can produce is 720p, which can be problematic for PC users who want to produce a high-quality video. If you are looking for a recording software which also allows you to edit your video footage with plentiful video editing features, we recommend you try Filmora Scrn based on the following powerful recording and editing features.